Honey Lime Fruit Salad is the perfect dish for an elegant brunch, or a lazy Sunday morning. It comes together in just minutes with a few simple ingredients. As the signs of Springtime grow all around us, I look forward to eating more fresh seasonal fruits. It’s also the start of a season of weddings, and baby showers and, in our family, birthdays. 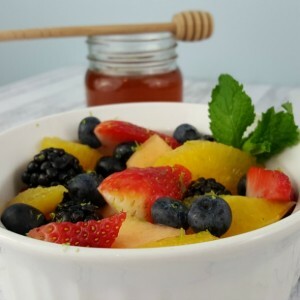 This Honey Lime Fruit Salad is a delicious dish to serve at your next gathering. Everyone loves, fruit, right? Serve it wine glasses for an elegant mother’s day or bridal shower brunch. For Easter, layer it into a beautiful trifle dish where you can see all the gorgeous colors. When it comes to brunch, I like to keep it simple and easy! There’s something about honey and lime that I love together so much. It’s just so zesty and fresh, and oh-so-very delicious! I like using local honey, which is said to help with season allergies. In a large bowl, toss together the fruit. Add the lime juice and zest. Drizzle in the honey. Serve immediately, or store in the refrigerator for up to 3 days. This happened to be the assortment of fruit I had on hand at the time, but this fruit salad is equally delicious with a variety of fruits. Add raspberries, honeydew or whatever your favorites are to customize it to your taste. So while this is great for gatherings, you don’t need a special occasion to make this Honey Lime Fruit Salad – it’s good any time! And it’s kid-friendly, too. I pack a little of this in my daughter’s lunchbox to have at snack time. Whenever you enjoy it, you’ll love the honey and lime flavors together! Follow Juggling Act Mama – Ang Paris’s board Easter on Pinterest. 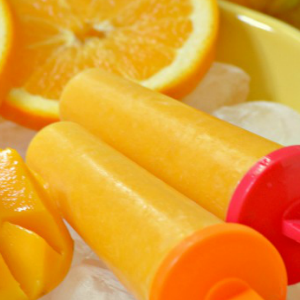 These super healthy Mango Orange Ice Pops made with fresh mango puree, orange juice, and vanilla yogurt are a great kid-friendly summer snack any time of day! Summer is here and I’m so ready to just relax and kick back with the kiddos. It is the perfect time to send the kids to play and not worry about getting dirty – that’s part of the fun of summer! And let’s face it, there’s nothing more quintessentially summer than ice pops! These are so easy to make, and super fun to make with the kids. The creaminess of the yogurt with the sweet mango and orange is just divine! These Mango Orange Ice Pops are a play on the Orange Mango Smoothie recipe I made recently. With Ethan’s food sensory issues, getting him to drink a smoothie is painful. But an ice pop goes down no problem! You’re going to love how delicious and simple these are! Add all of the ingredients to a blender and process until smooth. To make pops, pour the mixture into a mold and freeze until solid. Don’t these just look divine? Of course you could play around with the flavors if you like. Mango and pineapple would be delicious also, or add some strawberries to the mixture – whatever your family enjoys. What’s your favorite fruit combinations?